A telephone (derived from the Greek: τῆλε, tēle, "far" and φωνή, phōnē, "voice", together meaning "distant voice"), or phone, is a telecommunications device that permits two or more users to conduct a conversation when they are too far apart to be heard directly. A telephone converts sound, typically and most efficiently the human voice, into electronic signals that are transmitted via cables and other communication channels to another telephone which reproduces the sound to the receiving user. The essential elements of a telephone are a microphone (transmitter) to speak into and an earphone (receiver) which reproduces the voice in a distant location. 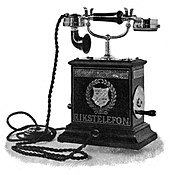 In addition, most telephones contain a ringer to announce an incoming telephone call, and a dial or keypad to enter a telephone number when initiating a call to another telephone. The receiver and transmitter are usually built into a handset which is held up to the ear and mouth during conversation. The dial may be located either on the handset or on a base unit to which the handset is connected. The transmitter converts the sound waves to electrical signals which are sent through a telephone network to the receiving telephone, which converts the signals into audible sound in the receiver or sometimes a loudspeaker. Telephones are duplex devices, meaning they permit transmission in both directions simultaneously. 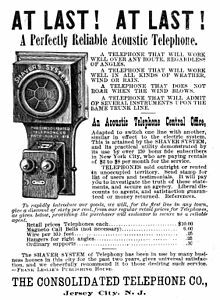 The first telephones were directly connected to each other from one customer's office or residence to another customer's location. Being impractical beyond just a few customers, these systems were quickly replaced by manually operated centrally located switchboards. 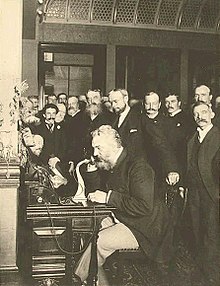 These exchanges were soon connected together, eventually forming an automated, worldwide public switched telephone network. For greater mobility, various radio systems were developed for transmission between mobile stations on ships and automobiles in the mid-20th century. Hand-held mobile phones were introduced for personal service starting in 1973. In later decades their analog cellular system evolved into digital networks with greater capability and lower cost. In the United Kingdom the blower is used as a slang term for a telephone. The slang came from the Royal Naval ships prior to telephones. Communication was direct, through a voice pipe. The pipe had a whistle inserted at each end. When a message was to be passed, the caller would remove the whistle at his end, place his mouth into the cavity, sealing it. He would then blow hard. The whistle at the other end would attract the man on watch. He would remove his whistle and call into the pipe. Conversations over, both whistles were replaced. Early telephones were technically diverse. Some used a water microphone, some had a metal diaphragm that induced current in an electromagnet wound around a permanent magnet, and some were dynamic – their diaphragm vibrated a coil of wire in the field of a permanent magnet or the coil vibrated the diaphragm. The sound-powered dynamic variants survived in small numbers through the 20th century in military and maritime applications, where its ability to create its own electrical power was crucial. Most, however, used the Edison/Berliner carbon transmitter, which was much louder than the other kinds, even though it required an induction coil which was an impedance matching transformer to make it compatible with the impedance of the line. The Edison patents kept the Bell monopoly viable into the 20th century, by which time the network was more important than the instrument. In 2002, only 10% of the world's population used cell phones and by 2005 that percentage had risen to 46%. 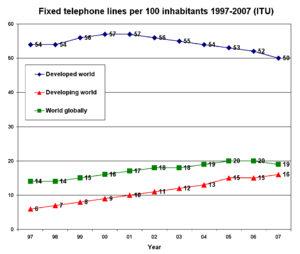 By the end of 2009, there were a total of nearly 6 billion mobile and fixed-line telephone subscribers worldwide. This included 1.26 billion fixed-line subscribers and 4.6 billion mobile subscribers. ^ a b c Kempe, Harry Robert; Garcke, Emile (1911). "Telephone" . In Chisholm, Hugh (ed.). Encyclopædia Britannica. 26 (11th ed.). Cambridge University Press. pp. 547–57. ^ Timbs, John; "Year Book of Facts in Science and Art", 1844 edition, p. 55. Google Books. This citation is referred to also in the book "The Telephone and Telephone Exchanges" by J. E. Kingsbury published in 1915. ^ Coe, Lewis (1995). The Telephone and It's Several Inventors: A History. Jefferson, NC: McFarland & Company, Inc. p. 5. ISBN 978-0-7864-2609-6. ^ ‹See Tfd›US 174465 Alexander Graham Bell: "Improvement in Telegraphy" filed on February 14, 1876, granted on March 7, 1876. ^ "Puskás, Tivadar". Omikk.bme.hu. Retrieved 2010-05-23. ^ "Ringer Boxes". 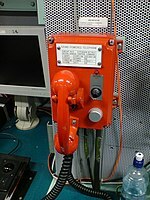 Telephonymuseum.com. Archived from the original on 2001-10-12. Retrieved 2010-05-23. ^ Circuit Diagram, Model 102, Porticus Telephone website. ^ Sheridan, Barrett. "Newsweek – National News, World News, Health, Technology, Entertainment and more..." MSNBC. Archived from the original on January 18, 2005. Retrieved 2010-05-23. ^ "Are Cell Phones Ruining Our Social Skills? – SiOWfa15: Science in Our World: Certainty and Controversy". sites.psu.edu. Bruce, Robert V. (1990). Bell: Alexander Graham Bell and the Conquest of Solitude. Cornell University Press. ISBN 978-0-8014-9691-2. Mueller, Milton. 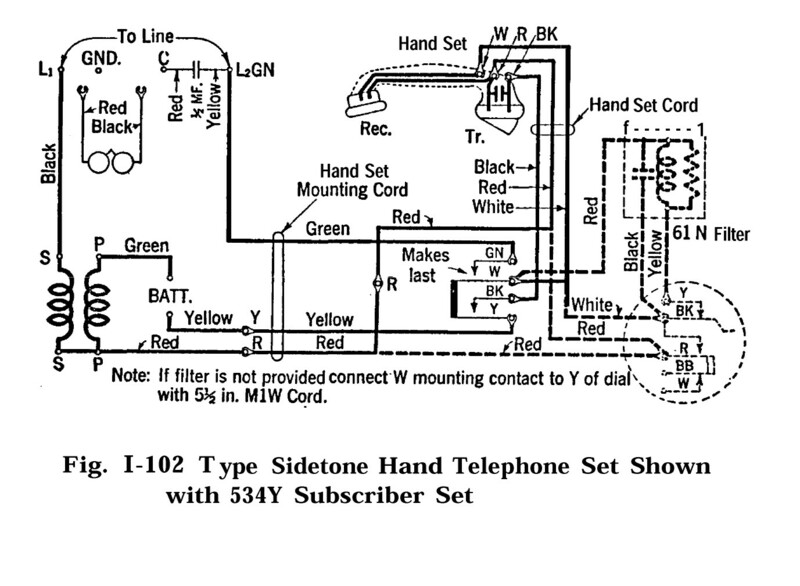 (1993) "Universal service in telephone history: A reconstruction." Telecommunications Policy 17.5 (1993): 352–69. "Telephone" . New International Encyclopedia. 1905. Kempe, Harry Robert; Garcke, Emile (1911). "Telephone" . Encyclopædia Britannica. 26 (11th ed.). pp. 547–557. This page was last edited on 11 March 2019, at 17:31 (UTC).